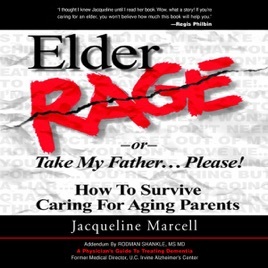 Elder Rage is a Book-on-the-Month Club selection (a caregiving book first), receiving 500+ 5-Star Amazon Reviews, is required reading at numerous universities for courses in geriatric assessment and management, and considered for a film. It is a riveting, often LOL true story about Jacqueline Marcell's trials and tribulations managing the care of her challenging elderly father and sweet ailing mother. After fighting through the medical system and depleting her parents' life savings and much of her own, Marcell solved her eldercare nightmare medically, behaviorally, legally, financially, and emotionally-and shows you how you can too. Elder Rage answers difficult questions such as how to get obstinate elders to: discuss long-term care options, accept cleaning and caregiving help, see different doctors, have medical tests, give up driving, attend adult day care, take medication, sleep, bathe and eat properly, move to a new residence, etc. - and teaches you how to manage stress, siblings, healthcare professionals, guilt, and grief.